Looking for a promotional product to help write the story of your business? 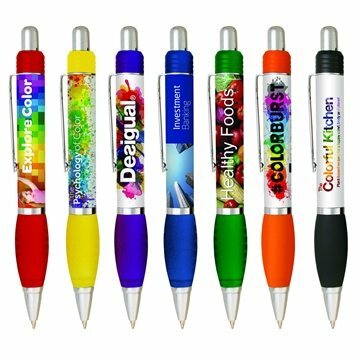 Then add your custom imprint to this full color wrap pen! Featuring a plunger style design this writing implement writes in black ink and has a clip for added convenience. An ideal giveaway at tradeshows, fundraisers, conferences, and gift shops! Everyone who has seen them continues to be very excited. It had been an excellent gift. durable and decent thickness. Cut well to allow for both men's and women's wear, without being bulky I like how you corrected the color of the image to match the rest of the magnet.